In Ferndale/Detroit, yesterday and today are hitting temperatures in the high 90’s with around 70% humidity. The heat is oppressive, to say the least. I’ve been staying indoors in the cool air conditioned climate as much as possible, but the chickens don’t have that luxury. The temperature sensor in the coop read a whopping 100 degrees at noon yesterday, and the ladies were hanging out below it, panting hard and keeping their wings away from their bodies. Buff orpingtons like these were bred in England, and are cold hardy- which means they’re absolutely not designed for this sort of stifling weather. Luckily, this should be the last day like this for a while, but if we continue to encounter temps like this, I have a plan. 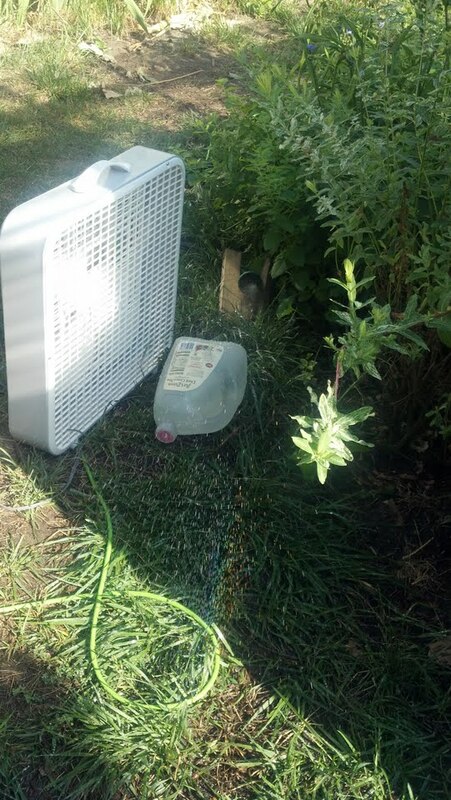 I’ve been filling large bottles with water and freezing them solid; we placed one in front of the box fan and angled my hose set to “mist” so that the water hits the frozen jug and the cooled vapor gets blown at the coop run. We made a simple evaporative cooler for the girls that seems to have helped in a major way. I’ve been filling large bottles and jugs with water and freezing them solid- it makes your freezer run more efficiently to have them in there, and I’ve got them on hand to place in the coop run for the chickens to hang out nearby (not that they do, but even having it in the vicinity seems to help). 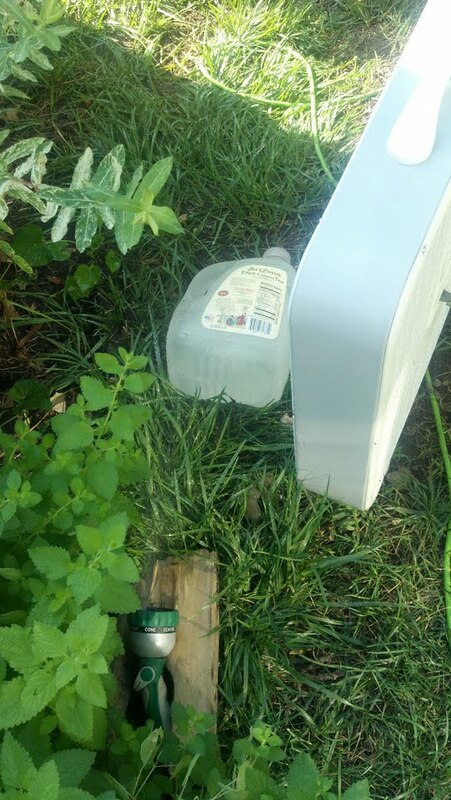 To make it, we place a box fan a short distance away from the run, placed the frozen jug in front of it, and angled my hose set to ‘mist’ so that the water hits the frozen jug and gets blown toward the run. The cooled vapor travels into the shadey area under the coop, where the chickens like to hang out- I can FEEL that it’s cooler down there than it is in the surrounding yard. Best of all, the chickens don’t seem to notice it too much, and just hang out under the coop as they usually do. 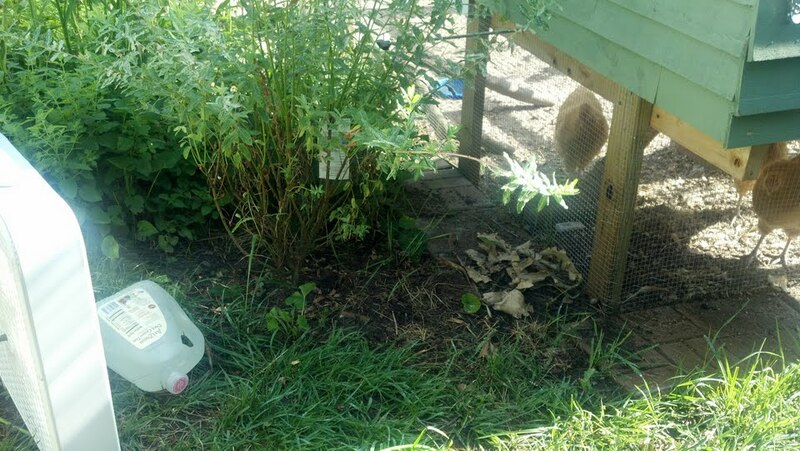 Yesterday, during intial setup, we discovered that they would NOT hang out in the shade under the coop with the fan directly against the runs fencing- it was just too new and scarey for them, and despite the heat they were standing in direct sunlight away from the fan. Once we moved it away and behind some plant life, they went right back into the shade. Care also needs to be taken to not spray too much water into the area you want them to hang out in- they’ll avoid having the water hit them. In addition to the evaportive cooler, I added some “Sav-a-chick” to a giant metal waterer and placed it down in the run (rather than inside the coop itself). It’s basically gatorade for chickens, helping to keep them hydrated while they’re panting and losing water through their heavy breathing (this is primarily how they cool down). They each drink roughly .5 liters of water in the summer; you want to keep them stocked with water at all times, and keep the water cool (ie. not out in the sun). Drinking cool water will decrease their core body temperature, and having the “chicken koolaid” mix in there will reduce their need to drink, avoiding any potential “water toxicity” issues (unlikely to happen, but possible). I also put out a shallow dish of water that they could stomp around in, but they’re avoiding it like the plague. We’re also being mindful of what they eat right now- greens and cool fruit are a better choice, and care should be taken to avoid cracked corn and corn products, as those will raise their core body temperature (so keep it handy for winter!). In the event that they show signs of not being able to handle the heat even with these precautions, I’ve got a tent set up in my basement that I’ll move them into. I’m hopeful that it won’t come to that, since I’m sure the change of scenery would stress them out only slightly less than the extreme heat. Chickens in Hot Weather: 17 Ways to Help Keep Your Flock Cool This Summer. I’ve been worrying about this for a while- it seems silly right? Worrying about chickens getting too hot in Michigan. I get asked a ton of questions about keeping chickens through our cold winters, but nobody ever thinks to ask if they’ll be ok in 90+ degree weather with high humidity. Chickens’ bodies perform best below about 75 degrees F; over 90F they can start to have real problems, especially heavier breeds. They can suffer heat stress and stop laying eggs, and on the extreme end of the scale they can die. We had an incident when the chicks had only been here for a week- it was early March, they were tiny and living in a brooder box under a heat lamp, and our weird Michigan weather zoomed up to the high 80’s. I came home from work and found the little chicks panting and laying down in the brooder box, wings outspread. I’m pretty sure that scarred me, and I’ve been paranoid about temperature extremes ever since. 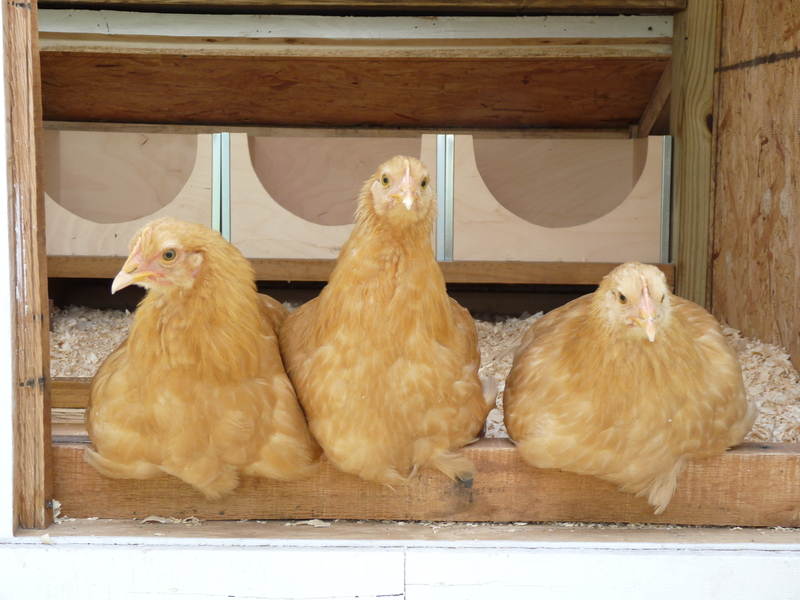 Provide shade: the girls like to hang out under their coop even now, digging shallow holes and taking dust baths. In the summer, I’m assuming this will be where they spend a lot of their time- if I feel like they’re not getting enough shade, I may just throw a tarp over the top of the run to provide a little extra protection from the sun. Keep them supplied with cold water: it should be pretty easy to toss a few ice cubes into their waterer, and since I usually keep it in the coop it’ll be shaded. Provide dirt bath areas: the girls have already created some good spots for dust bathing, in the shadow of their coop. I have a hard time imagining any scenario where a chicken didn’t have a place for dust bathing, unless they had a wire or concrete floor in their run. Add electrolytes to their water: I picked up several packs of these from Tractor Supply when I was getting supplies before getting the chicks- we still haven’t used them, so when it gets hot I’ll definitely add them to the water. Turn off lights in the coop: no problem here, since we don’t have a light in the coop. Increase the ventilation in the coop: we have two vents in the ceiling with adjustable vent flaps that can direct air in or keep it out, and a large screened back window. In the summer, we’ll definitely keep the back window shutter open, adjust the vent flaps to direct air in, and there’s the possibility of leaving the front leaded glass doors open (I don’t like that idea, because even though we’re confident that the run is predator proof, I’d rather not take any chances). Place reflective foil on the roof of the coop in the morning: kinda the premise behind those car dashboard visors. We likely won’t use this due to the green roof, but it’s a smart tip to keep in mind with other coops. Give them a shallow pan of water: like a bird bath! In general I want to keep these chickens completely dry, but if they opt to splash around in some water, I won’t stop them. Install a fan in the coop: I’ve been considering this, but with my set up I’m not sure how I could make it work. The fans would need to be on the side of the coop, and I certainly wouldn’t want them there in the winter; I’d need to install them and then board them up when it got too cold out. If there’s a way I can do this without destroying the aesthetic of the coop and/or compromising the structures ability to keep them warm and dry in the winter, I’ll consider it. Give them cold/frozen fruits and vegetables: watermelon seems like it would be a great choice for this. I’ll definitely be doing this one. Don’t feed them cracked corn: I’ll save the cracked corn for cold weather, since it brings up their body temp. Dig a shallow pit and lightly mist it with water: I can see doing this in extreme situations, making the hole deeper than it would normally be from their dust bathing. Freeze water bottles or milk jugs with ice: kinda like air conditioning for the chickens! I bet they’d wind up scared of it, like they are of most new things. Still, in an extreme situation, this seems like it would help immensely. Leave them alone: keeping their stress levels low is the name of the game, and something I try to do regularly anyway. The only time these girls really get ruffled up is when my bf’s dog circles the coop run, breathing heavily. Put sprinklers on the coop roof: I can’t do this with my setup, but I do wonder if watering the green roof wil help. Decrease the litter in the coop: we only have maybe an inch and a half of pine shavings in the coop at present, and the litter gets cleaned daily, so this may not help much. The theory is that deep litter acts like a compost pile, generating heat- so, if you’re a deep litter coop, you’ll want to take this advice to keep the heat level down. Mist them with cool water: I’m pretty sure the chickens would freak out if I did this, so chances are I won’t. Armed with these tips, I’m hoping I won’t have a repeat of our “too hot” incident- I’ll still keep my eyes peeled for signs of heat stress throughout summer.